That underwater night vision camera sounds very interesting. Very ambitious project here but I like how you're pushing the envelope as usual. On another board, a fellow had rigged up something similar but his was a towed depth finder I believe. 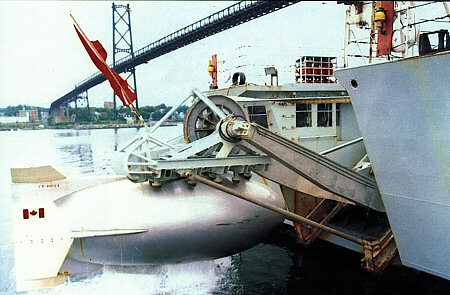 This is all very similar to what navies around the world use to find enemy subs using a towed sonar array. I suspect you will have to make your lure more hydrodynamic, add some fins so that it will track in a straight line instead of wallowing/waddling while underway and quite possibly add some down-angled dive planes so that it "dive deep" and stay down. You might enhance its towing behavior by altering the cable attachment point toward the front of the lure. Paint it another color or wildlife down below may find it appetizing! Thanks! yea im going to add fins and paint it up similar to the ships colours so it looks like a little rov, it looks so dumb with that stupid fish eye on the side of it, also the camera is upside down too, so ill have to flip it over, but its coming, I also want to add a spring loaded keeper on the cranes pulley so the cable can't jump off the pulley, and im thinking of having a little fish food launcher disguised as a depth charge too, to bait some critters into the area under the boat. You've almost matched the VDS (Variable Depth Sonar) Systems that we used to have in the Navy.